Another great readathon. Sorry for the late post, but I hit stop on the timer and crawled into bed. 1 I read 4 books, 3 magazines and listened to 1 audiobook. This totals 1411 pages and 5 hours on an audiobook. 2. I read for 24:00:08:48 according to my stopwatch. 3.I loved the posts and updates from fellow readers, and I always love the spine poetry. 4. I think this was the best one yet. 5. Are you kidding – July here we come. I’m planning already. In case that wasn’t clear – YES!! I am just getting around to commenting, but here’s what I did… 7.25 by my phone stopwatch. This was the first time I had ever been so precise, and I loved turning the stopwatch on and off. It really made me accountable in a way I hadn’t done in other readathons. I finished three books and started a fourth. All three of the books I had already started, and this readathon did exactly what I needed it too – helped me get over the hump of finishing them. I felt really victorious to just get them done. The thing that didn’t work well for me – well, that it was the weekend of the women’s march. You couldn’t control that, but every time I went to FB for inspiration, I got inspiration of a different kind, and so much more – it drowned out the readers, and actually made me feel a little silly for doing a readathon, I couldn’t just find the readathon posts by scrolling, and I think I ended up wasting time on FB, even though I was vowing to stay off social media/my phone so I could read. That being said, I am all in for July. I love readathons, and I love getting a big pile of books completed. Of the three books that I finished, two of them were nonfiction, which took a lot longer to read. It was a great weekend of reading. 1. It never dawned on me to count pages but I dipped in and out of 2 books, 1 audio book and several magazines. 2. I read for about 9 hours. I had company in town so all of that was squeezed in around socializing. I’ve got the next 24in48 Readathon on my calendar for July. With all this time to plan, I hope to get much closer to the 24 hour mark then. 3. I loved the challenges. And I’m going to be thinking about what could be my best spine poetry for the next time. 4. I thought it was great. I can’t think of any improvements. This was a great readathon, once again!! I read 4 books, & started on a 5th. That added up to 1234 pages. I read for the full 24 hours. The readathon was great, and I love that we had people posting on many platforms. I will definitely be participating in the next one!! 1. I read part of 3 books, listened to part of 2 books, and completed 3 entire books. 2. I read 20 hours – the most I’ve ever read in a Readathon. I someday hope to make it to 24, but I am very pleased with 20! 3. I love the regular check-ins here, the challenges, the use of the hashtag to connect with people on social media. 4. I can’t think of any way to improve – I love it! 5. As long as I am in town, I will definitely participate in July! I finished 4 books, and read parts of 3. I sort of tracked pages in my journal – after adding them up (and extrapolating approximately how many pages of paper book equaled the amount of time I listened to an audiobook), I came up with 1305p read. Whew! 2. How many hours did you read? 3. What do you think worked well in this readathon? 4. What do you think could be done to improve the readathon for next time? This suggestion about adding a dropdown might be the single best suggestion I’ve ever gotten. Thank you!! 1. I read 8 books and started a nineth book. Thank you so much; this was fantastic! How many hours did you read? 24 hours. What do you think worked well in this readathon? The twitter comunication. So fun to talk to so many different people. What do you think could be done to improve the readathon for next time? I really enjoyed it. Low key and not much you had to do (other than read). Will you participate in a future 24in48 readathon? Yes, if I can. 1. I read from six books (including an audiobook). I didn’t keep track of the pages. 2. A little more than 26 1/2 hours! 3. Using an audiobook helped when my eyes got tired. I read some poetry or children’s books when I needed a brief break. I liked the timed updates every three hours. 4. Last one you asked for more posts on Litsy. I felt like there were fewer this time. I liked getting to interact with others on social media rather than a blog. 5. YES! I’m very excited for July! 1. Books/pages read: I read a total of 1050 pages: two books, one graphic novel, 3 single-issue comics, and half a book of poetry, as well as some miscellaneous reading on already-in-progress books. 3. What worked well: I love the flexibility to fit in my 24 hours within a larger time frame—sleep is good! I also loved reading along with others on Litsy (my social media platform of choice!). It was a nice quick way to check in here and there without too much distraction from reading. 4. Improving the readathon: I’d love to see more of the blog content (even just links) posted on Litsy (it’s easier to check in on “quicker” platforms, and I’m not on Twitter). I missed most of the initial blog content because I was just checking Litsy (my own fault, but still). I’d also love to see most of the challenges be quicker/simpler or focused specifically on the readathon (i.e. shelfies, hours/pages read so far, pic of what you’re reading now), rather than things like creating book spine poetry (that takes a while!). 5. I will definitely participate again—thanks so much for running this—I had a blast! 1. How many books did you read? I finished one book, read a graphic novel and a novella, and started a third. 2. How many hours did you read? Nine hours, 13 minutes. 3. What do you think worked well in this readathon? I loved participating on Litsy – it’s a fun online community event and a good way to push myself to read instead of doing other things. 4. What do you think could be done to improve the readathon for next time? Having it on this weekend didn’t work out well for people who wanted to participate in the Women’s March. I realize that couldn’t possibly have been foreseen but I think a lot of people were in the same boat. 5. Will you participate in a future 24in48 readathon? Definitely! I finished a book I was reading, plus read 4 more. None of my books were very long, so my page total was 663 pages. I only read on Saturday, 12 1/2 hours. I planned to read Sunday, but woke up sick and slept all day instead. Ugh. I’d have rather been reading. I read 1667 pages in 24 hours. Loved everything but especially the posts every three hours. I’m looking forward to my fourth 24in48 in July. Thanks, Rachel, for your efforts! First of all, thanks so much for another great experience! 3) Everything about this readathon worked well, I think. think of anything on your end – though there are some things that I will do differently in future challenges. I finished one book and several short stories and made progress in four other books. I read a little over twenty hours, which is more than I did last time! I enjoyed the easy posts every three hours but agree with others that the Readathon should be rescheduled on inauguration weekends. Of course I’ll participate again! See you in July! 2.How many hours did you read? 3.What do you think worked well in this readathon? This was my first 24in48, but I thought everything worked well…loved the updates every 3 hours, instead of hourly. 4.What do you think could be done to improve the readathon for next time? I have no suggestions to improve, as I saw nothing to improve. 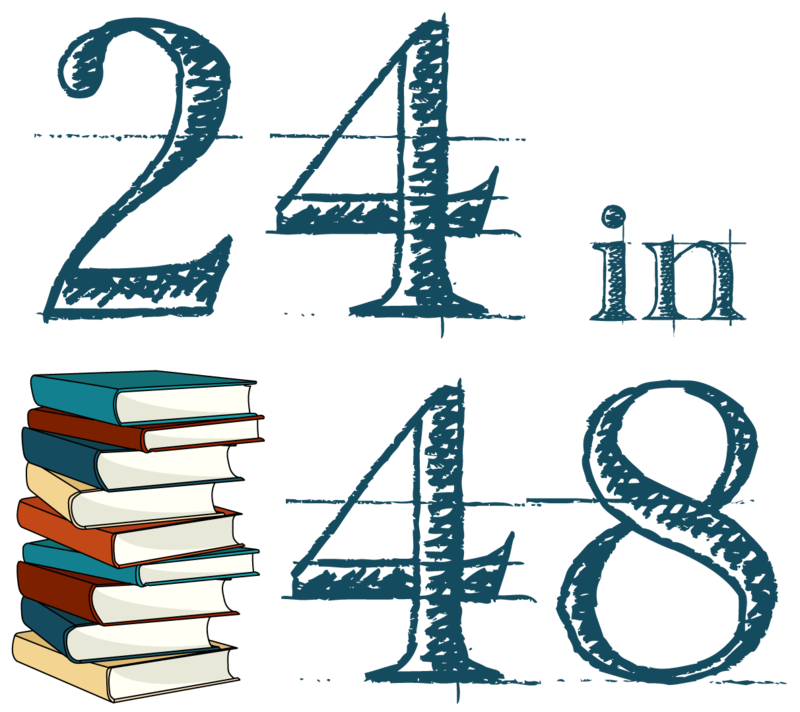 5.Will you participate in a future 24in48 readathon? Thanks to everyone you worked to put this together, proved prizes, and participated!! 1. I read three full books (one on audio, one graphic novel) and halves of two others. Didn’t keep track of the pages. 2. I read about 18 hrs. 3. I thought everything worked well. 4. No suggestions – it was great! 5. Probably. I lose my ability to enjoy/retain books after a certain amount of time reading, so I may not ever make 24, but it’s fun to join in! 1. I read 1 full book (it was 600 pages!) A graphic novel, listened to part of an audio book and started another. 3. I liked that it was across social media. I think the challenged worked well and I liked that there was a post every 3 hours. Thank you for this Readathon! I really enjoyed it and am looking forward to the next one! I read six altogether: four paper books I finished and one audiobook I didn’t finish and one paper book I was in the process of reading when the time ran out. Total page count was 1,098 for three hardbacks and 2 trade paperbacks. I got through 9 hours and 11 minutes of the audiobook. As far as how the readathon worked out, I didn’t see anything you could have done better. I would have liked to have more time spread out so I could have interacted more but Saturday was too full with other things and Sunday I almost had only enough time just to read. I will definitely be participating in the next one. Thank you again for going through the madness twice a year with/for us! I have so much fun, and this one really helped me break through a reading wall I’ve been trying to get past. 1. I finished 6 books, 5 of which I started during the readathon and then I started 2 more books that I did not finish. Overall, I read about 1400 pages. 2. I read for 24 hours and 6 minutes! I wanted to read for even longer to finish the book I was reading at the time, March Book 2, but my brain and body shut off once the goal was accomplished. 3. The little challenges were fun and the encouragement from other readers on Twitter was great! 4. Maybe an official BookTuber host would be nice. I found the online book community through BookTube and it is the main place where I engage with the book community. If a partnership could be made with one or more BookTubers and then if these individuals were asked to make official announcement videos etc and perhaps a couple updates, that could be helpful to get more people to join. 5. I would love to join a future 24in48 but my ability to join all depends on how busy my work is at the time, so I will have to wait and see! 1. 4 books plus a bit of a fifth. 2. I read for about 11 hours on Saturday and about five on Sunday- so approximately 16 hours. I didn’t think to use a stopwatch. 3. I really enjoyed it. I would definitely do it again. 4. No suggestions. Also – I filled out that survey but I didn’t complete and I didn’t establish proof! Read a book and a half, but since in their original version they’re one book, I think I’ve read 75% of a book. Read about 700 pages. It was a bit awkward being in a different timezone and trying to keep up with the posts on the blog. 5. Will you participate in a future 24in48 readathon? Yes! It was a really great experience! 1 – How many books did you read? Pages? 2 – How many hours did you read? 3- What do you think worked well in this readathon? I liked that this was totally stress-free… you could read whatever you wanted, however you wanted, for how long you wanted… it was nice! 4 – What do you think could be done to improve the readathon for next time? First, I have to be better organised next time XD I wasn’t well prepared for the readathon. As for what could change, I think I’d like more challenges. I like that there’s just one post every three hours, because a post every hour for 48 hours would be madness! But I think there could also be a mini-challenge every three hours? I like challenges, so I’d really like that! 5 – Will you participate in a future 24in48 readathon? 3. Blog updates were great – fun, not too many, not too few. Loved all the social media activity, too. And sleep – love sleep. 4. Really can’t think of anything. Thank you so much for all the time and effort you put in to make this such a fun event! 1. I read 4 books: two novels and 2 graphic novel volume bindups….1122 pages total!!! 2. 24 Hours and 5 Minutes total – although that last hour got a little loopy! 3. I loved being able to post on different social platforms: Twitter, Instagram, and Litsy – it was a great way to make contact with other ‘thoners! So much fun! 4. I didn’t realize there were additional daily challenges, but it was my own fault…I didn’t really look too hard! haha But, I guess maybe pin those posts in Twitter for a bit until they’re finished! I saw someone’s on Instagram and Twitter and I wasn’t sure what it was at first! They looked like a lot of fun! I would love to try to participate in those next time, but this time it was fun seeing what others came up with!! 5. Absolutely! I had so much fun!! I want to do so much better next time!! I can’t wait! I hope I can work out the July one…but it’s my mom’s birthday weekend, so we’ll have to see! Are they always in January and July? How many books did you read? Pages? – I read 5 Books. A total of 1132 pages! -Personally, I think my own organization and preparation worked much better than the last time I did this readathon back in July. I 100% Introverted and refused all external activities! It was wonderful!!! As a whole, I can’t thank those in charge enough. You are amazing angels from Heaven and this was the best way to kick off my reading goals for the year!! -I could plan my food and my snacks out more – on a personal level. As a whole, I would say that I would like to see more of these. I know they have to take a lot of preparation and organization to get the prizes and things together, but more than twice a year would be wonderful, in my opinion.. but then maybe that’s something I should just do on my own..
Again, THANK YOU so much for organizing this wonderful weekend!! 1. How many books did you read? Pages? I read parts of two books. More than 200 pages! One was an ebook so I’m not sure how many pages total. Only 8. I had too many other things going on this weekend! I liked the countdown leading up to the readathon! I wasn’t able to participate as much as I would have liked, so I missed the challenges, etc. I know it couldn’t be helped that the readathon coincided with the women’s march! It would be nice if there were a centralized location to track hours? Like NaNoWriMo. It’s hard when everyone is spread out across different social media platforms. 1. I completed one book, about 400 pages. 2. I would guess I read 6. I stopped counting at 4. 3. I enjoyed the challenges, even though I didn’t keep up with them very well. I also enjoyed the update emails. 4. The only improvement needed is on my end. I’m not used to social media, but this was my first readathoname, and I learned a lot. Read three and a half (ish) books, 837 pages. Total hours 14 hours, 23 minutes. How many hours did you read? 16 hours. I enjoyed the various posts, it’s fun to see what people are reading and their thought on the readathon. I thought that it worked very well, nothing that I can think to change. I will participate in July, absolutely, I liked focusing on reading and it’s carried over to this week. I loved checking in to see the challenges and updates! Nothing I can think of to improve! I had a lot of fun. I’m already looking forward to July! 1. I didn’t keep track of pages, but I read two full books & about half of three others. 2. I didn’t keep a SUPER close count because I knew I couldn’t reach 24 hours, but all told, I estimate I read for 15. 3. It was well-advertised with a huge amount of participation, & I love that there are prizes!